I was making frozen pumpkin and banana sandwiches for my dog, and decided I wanted to make myself something cold and delicious to enjoy on this 90 degree plus summer day. 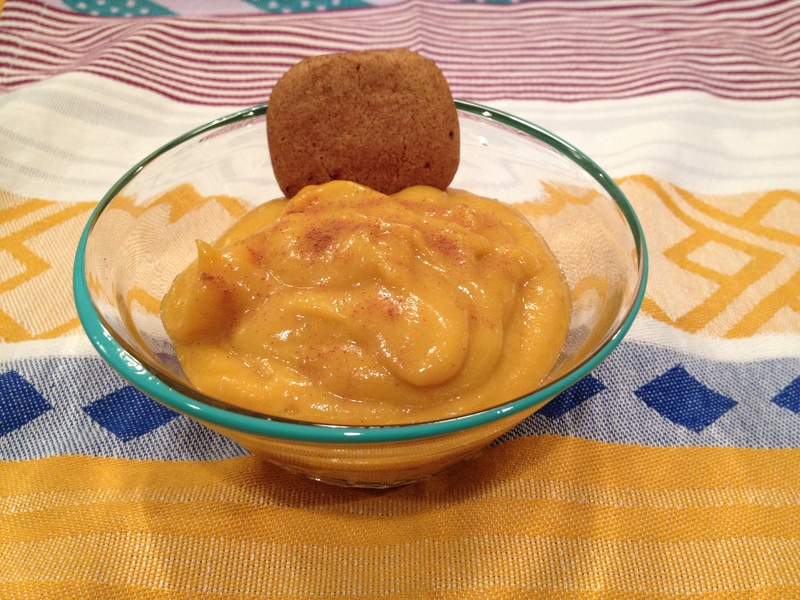 This custard, like the treats I made for Rynoa, is extremely simple to make yet full of flavor. My absolute favorite dessert is pumpkin pie, so I’m constantly looking for ways to bring that flavor to other recipes. The key to making this a creamy custard is to only freeze the banana slices for a few hours. This will ensure that they blend up creamy. It also helps to use chilled pumpkin puree if you are planning on eating it right away. I recommend serving it with a spicy cookie, such as the Enjoy Life snickerdoodle cookie I had with mine, and don’t forget to add the extra sprinkle of cinnamon on top. Slice banana and place slices into a sandwich bag. Freeze for 2-3 hours. In a blender, combine sliced banana with the chilled pumpkin puree (try to make sure it’s an equal volume to the banana), pie spice, and vanilla. Blend until smooth and creamy. Top with cinnamon. Serve immediately or place it in the refrigerator until your ready to eat it.